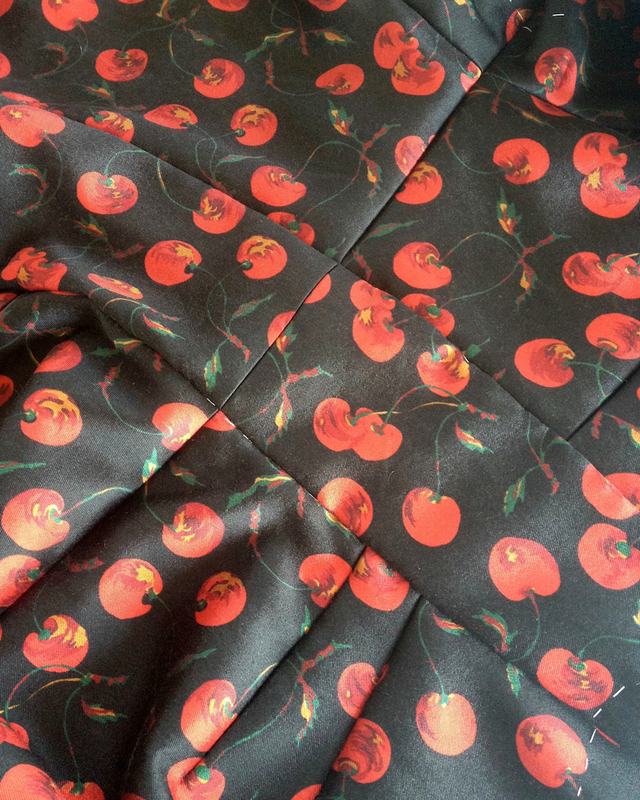 There are so many reasons I enjoy working with gorgeous fabric; one of the main ones, of course, is that it makes garment construction so much fun! 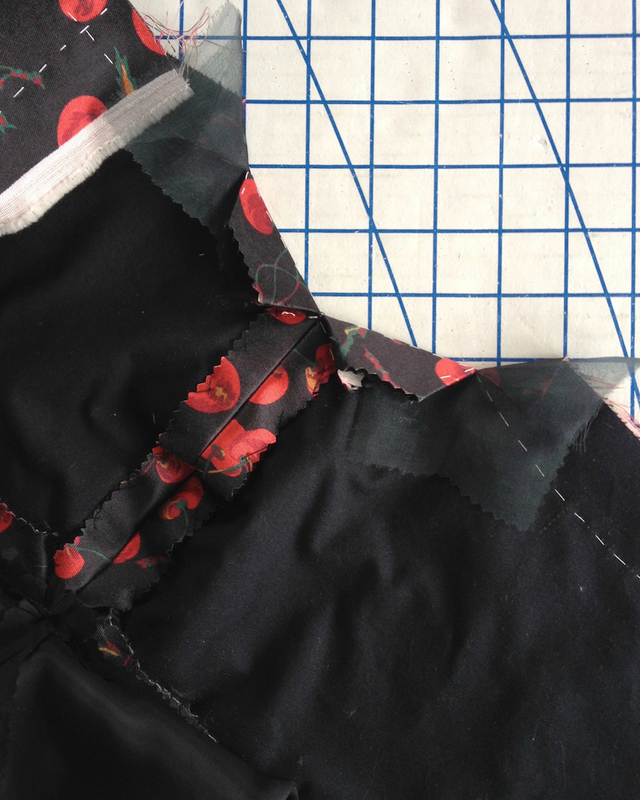 After managing to squeeze all of the pieces out of my leftover fabric, it was time to baste the layers together. 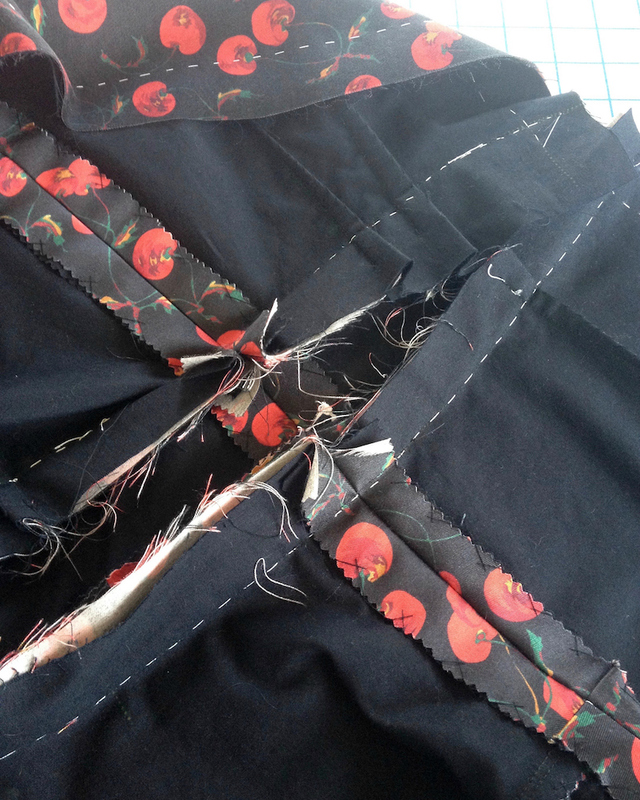 I like to use silk thread for this task - it is so much easier to remove, and definitely a pleasure to hand sew with silk. I had my suspicions that the neckline might want to gape, so I used a scrap of organza to stabilize that portion of the fabric (this particular scrap is dark green because I dyed it for use as the underlining of this dress, so it is a little bit difficult to see, but it's there, I promise!). 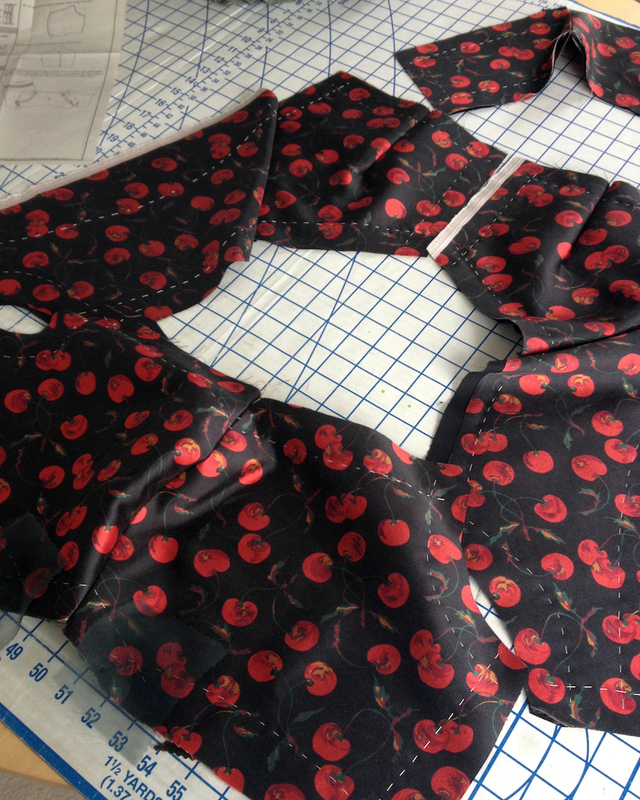 I measure off the length of the seamline and then subtract an eighth to a quarter inch and distribute the extra ease in the garment fabric along the length of organza. The organza is then stitched into place just inside the seamline so those pick-stitches will not show when the edge is finished. The skirt and midriff pieces went together fairly easily. The most irritating part of the process is removing those white basting threads after each seamline is stitched by machine! 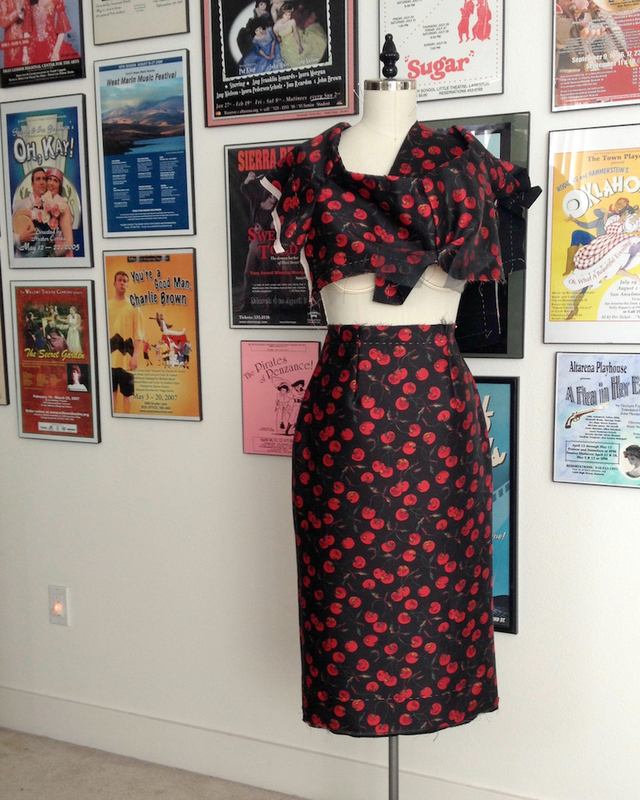 The skirt was then pinned to my dress form while I cut out a second version of the dress. Does anyone else have nightmares about slicing through a portion of a work in progress while using scissors on something else nearby? I have never been able to get over the paranoia, so I try to keep everything at least three feet from the working scissors! The bodice sleeves are raglan for this particular design, so everything looks a bit crazy during the construction process. 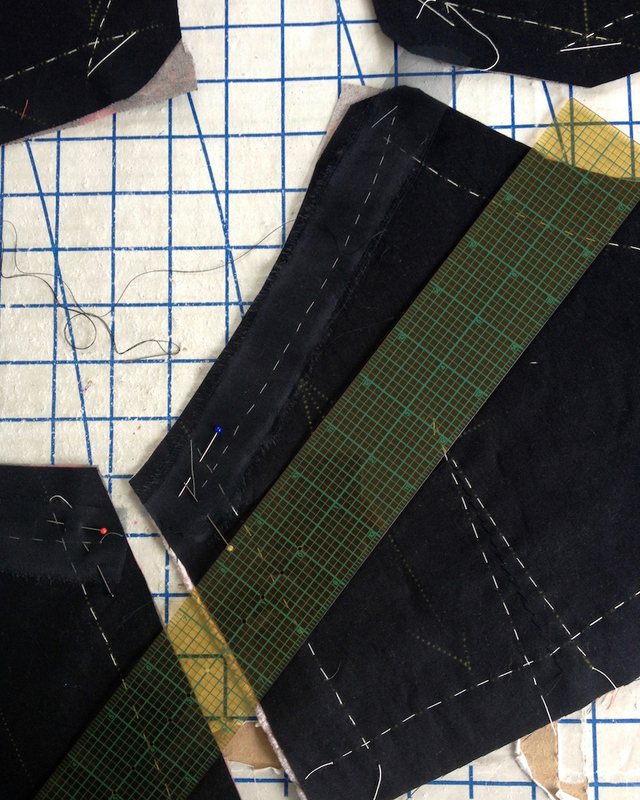 For very special fabrics, like this one, I do a lot of hand stitching. 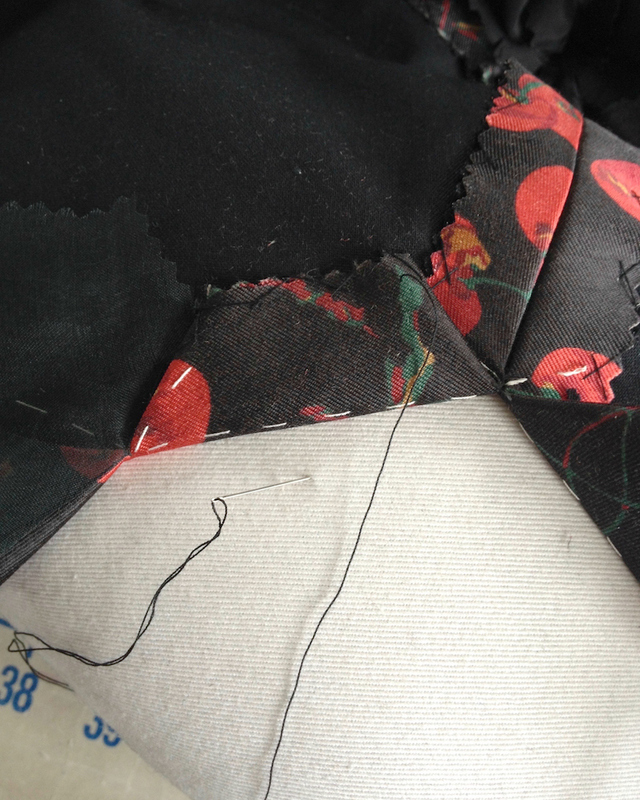 Because all of the pieces are underlined, those stitches are easily hidden from the right side of the garment. 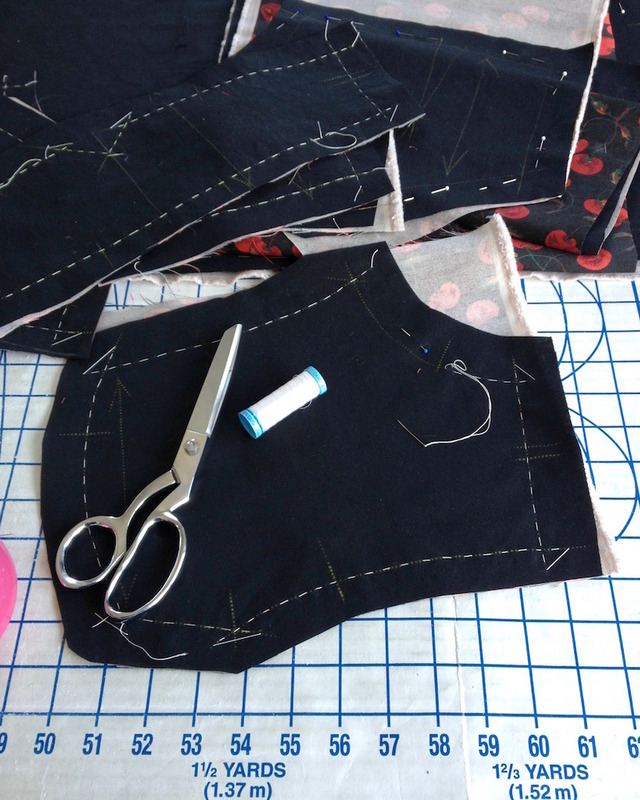 In a silk blend fabric, this is especially helpful, since even the tiniest of stitches stand out. 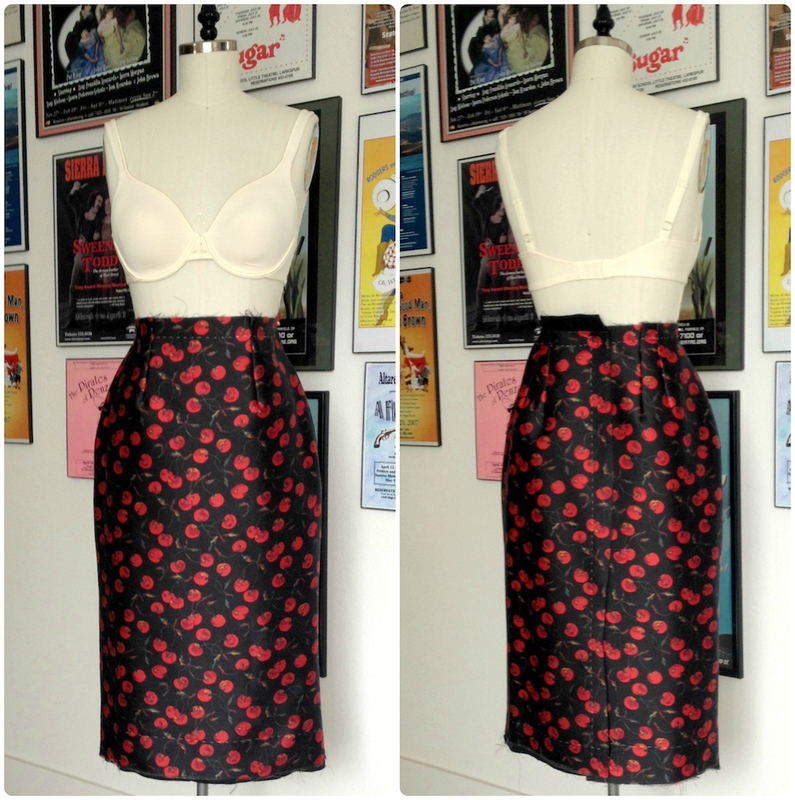 The midriff cutouts on this design require that certain points be snipped right up to the seamline. 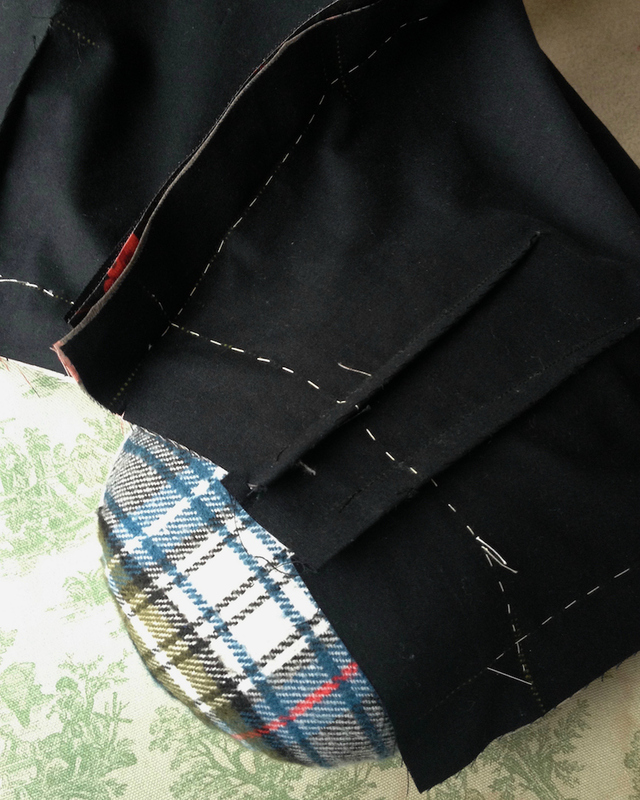 A simple line of stay-stitching did not feel sufficient, so I used another scrap of organza and this gusset trick to keep any raw edges nicely contained. 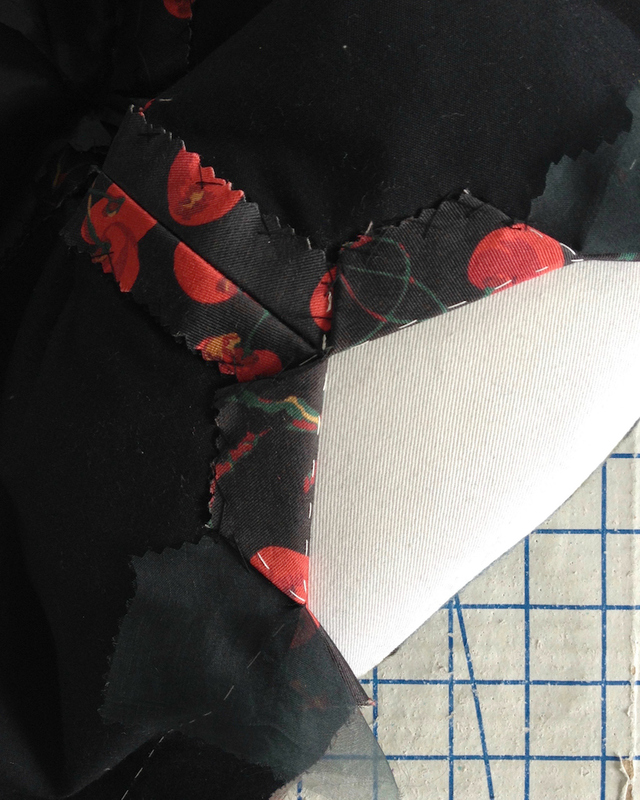 There is quite a bit of catch-stitching in this piece! 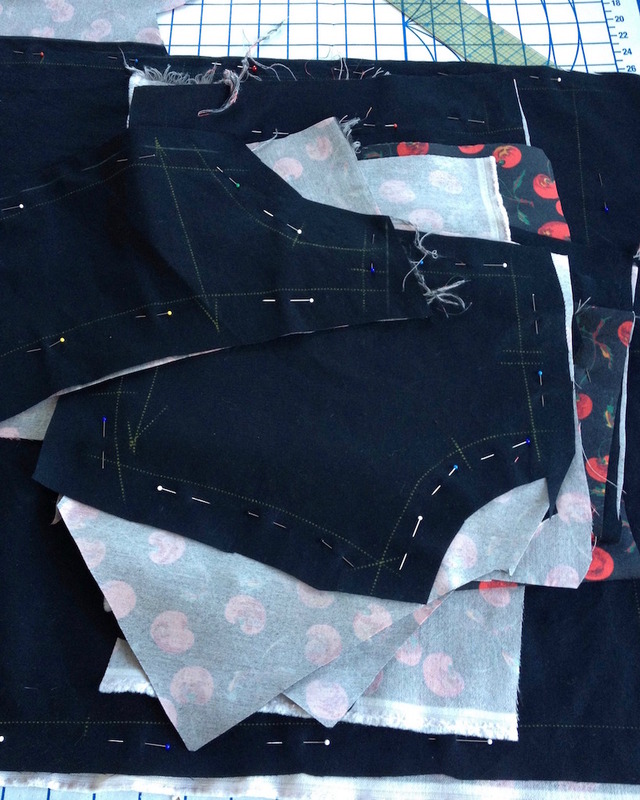 I like to use a ham to elevate my project an extra few inches - this makes it easier on my back when I am hand sewing for long periods of time. 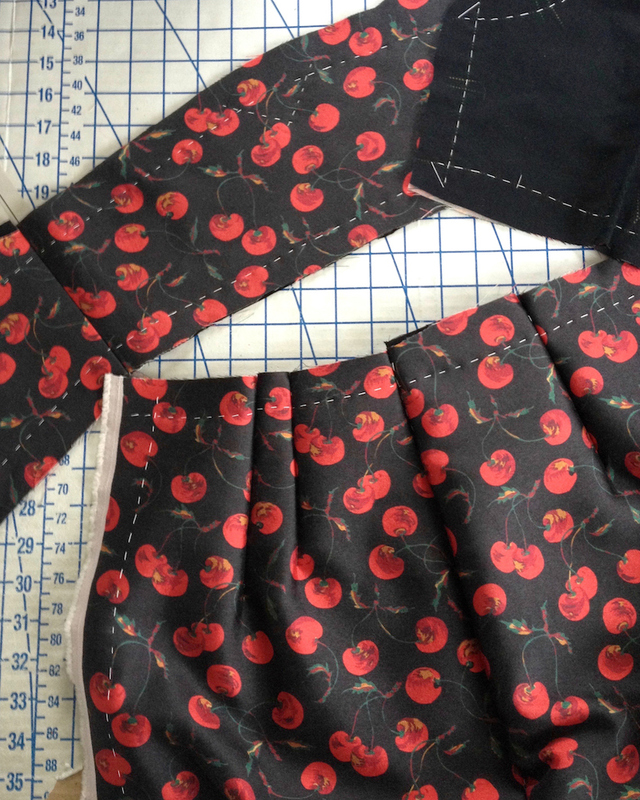 The real moment of truth is putting the bodice, midriff, and skirt sections together. Everything looks good! Now I need to tame those oversized seam allowances . . .
"So the dear is going on navel maneuvers, is she?" [pursed lips, with big eyes] "Mmmmmmmmmmmmmm hmmmmm!" "And thanks to all that organza, in tight formation." "She is sure to cherry-pick her territorial claims." "Pffffft, this is not a regional land-grab, but global a man-grab." "And who's to dispute anything while she's in that outfit?" "This is the pits! Our multi-year campaign has been fruitless, and now we're out-flanked." "Precisely. She has crafted, for her arsenal, something more awe than shock." "She can drop a jaw with a frock." [menacingly, in a lower register] "Whilst she paws playful with the doomsday clock." Beautiful workmanship - love the fabric too. It is always eye candy to see your work in progress pictures. Thanks for sharing!